The night skies of PyeongChang will be lit up during the PyeongChang Winter Paralympics, according to the culture and sports ministry Wednesday. During the nine days of the Paralympic Games, which will run from Friday to March 18, there will be many cultural events, performances and fireworks in various venues, including the Olympic Festival Park in PyeongChang, the Ministry of Culture, Sports and Tourism said. 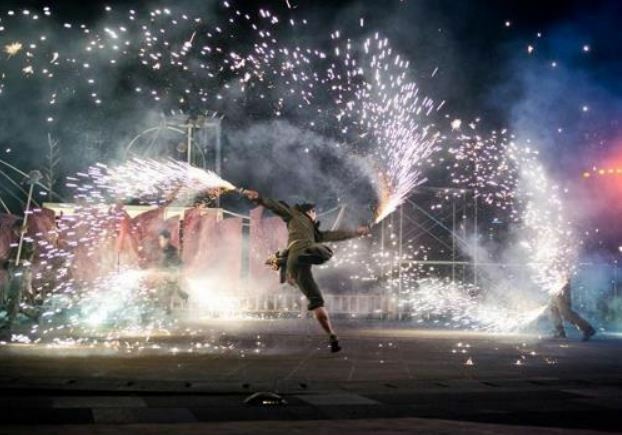 "Fire Fantasy_Magical Night" will be regularly performed at the park at 6:30 and 7 p.m., and there will be outdoor performances at 7 p.m. this Saturday and on March 17, accompanied by fireworks. This Saturday, some 35 musicians will hold three concerts at the Gangneug KTX station to wish for a successful hosting of the Paralympics. Throughout the Paralympic Games period, a light art show will take place at the outdoor stage set up at Wolhwa Bridge of Gangneung's Namdaecheon. The "Donghae Art Festa," the "DMZ Art Festa" and the "Public Art Project Gangwon," which started during the PyeongChang Olympics, will continue at various event venues. In Seoul, two Olympic-themed exhibitions are currently available for visitors at Culture Station Seoul 284 and Seoullo 7017.